Lake Annecy - Sevrier: Located 3 minutes from the historic center and the old town of Annecy this typical Annecy house on the lake can accommodate 4 people. There are 2 bedrooms and 2 bathrooms, 1 living room and 1 open kitchen, the bike path and lake are 200m. The municipal beach at 800m. The house is located in a hamlet of historic houses, very quiet. Possibility to convert rooms with two double beds 180X200 or 4 single beds 90X200. A deposit of 900 Euros will be requested and not cashed (by check or cash) for the stay and returned on your departure if nothing has been damaged. Fantastic week, gorgeous house and very helpful owner, we hope to return soon! We spent just under a week in the house which has everything you need, the attention to detail is first class even a chilled bottle of Champagne on our arrival. Richard is a fantastic host and assisted us with all of our needs including recommending and booking for us some great local restaurants, he even gave us a lift into Annecy one evening. (Restaurant L’Atelier Sens O – approx. 500 metres from the house is well worth a visit). Access to the lake and cycling path around the lake is very close to the house for which we used a number of times for walking and riding around the lake or into Annecy. There are also some amazing cycling routes into the mountains nearby. We very much enjoyed our stay and would highly recommend the house and will be back in the future ! Superbe maison au calme, très proche du lac et à 3kms de Annecy. Le ville de Sevrer est charmante et nous avons trouvé tous les commerces. Nous avons regrette que la maison ne soit pas décorée pour Noël. Au minimum un petit sapin. Séjour très reposant, cadre magnifique avec le lac à 2 pas, logement de très bonne qualité et magnifique, literie au top avec wc et douche dans chaque chambre, je recommande cette endroit, et surtout merci au propriétaire pour sa confiance et son accueille j 'y reviendrai dès que possible. Idéalement situé pour visiter la région, Lac à 2 minutes à pied, location bateau sans permis et embarcadère navette tour du lac à 15 minutes à pied. Annecy est à 10 minutes en voiture. Accueil sympa, logement cinq étoiles tout est parfait. Very warm and friendly welcome by the owners Mr. and Mrs. Antonioli. 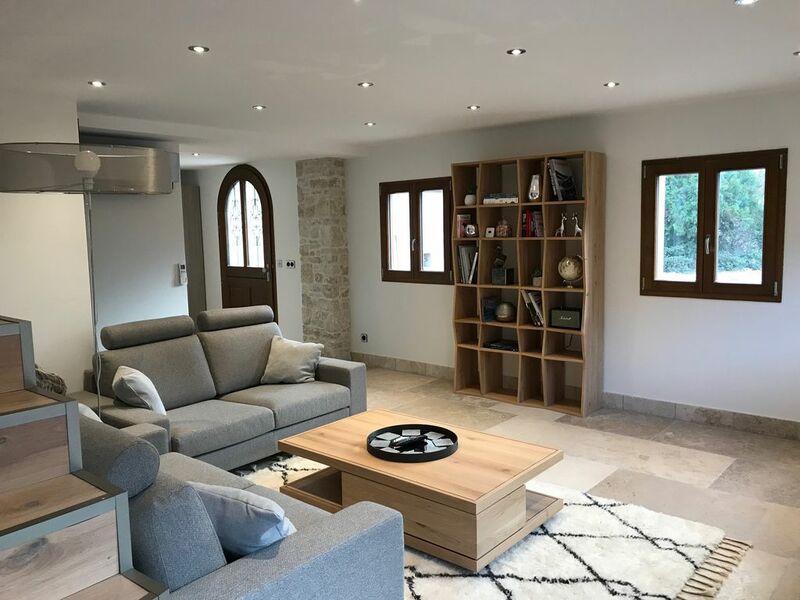 Very well located house for many activities like hiking, visiting Annecy or simply bathing in the Annecy lake or in little rivers close to the area. Small bakeries and supermarkets close to Sévrier offer possibilities to make daily shopping. Any car driving on the road around Annecy lake takes a lot of time. Very well atlernative is to use the cycling lane, which leads completely around the western part of the lake and is accessible in a distance of 100m of the house. Ask Mr. Antonioli for the OK to use 4 existing bicycles.